2018 Mallet Swap - What do you call an assortment of Mallets? After finishing the box swap, my first swap, I decided to participate in the mallet swap. It was a lot of fun. BeardedDog was my recipient. Since he hasn’t been on LJ long I figured I might as well make an assortment of mallets. 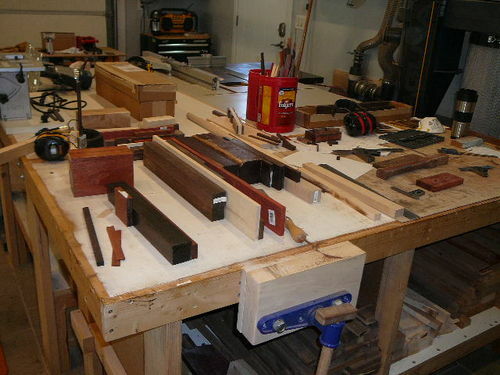 A couple of orders to Bell Forest Products provided a great assortment of exotic woods (katalox, brown ebony, african blackwood, bloodwood, cocbolo, ziricote, granadillo, yellow heart, redheart, bubing, and some curly maple and flame birch). My experience with exotics was limited to using them as accents so this was a first for me. In fact I had to ask what was the best way to get the wax off the blanks. I now own a veritas scraper. 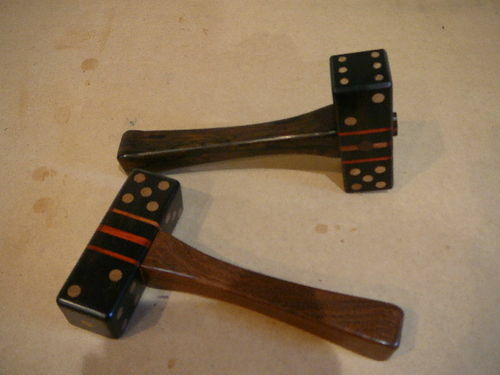 The dice mallets were first. Humming “Living in Paradise” by David Lee Roth, two mallets came together in no time. The heads are African Blackwood with brown ebony and ziricote handles. Unfortunately, a chunk came off the head of the ziricote one so it was relegated to a second. Corn is kind of an IA thing. A corn cob mallet was a no-brainer. Yellowheart makes perfect corn and walnut is the same color as the silk. 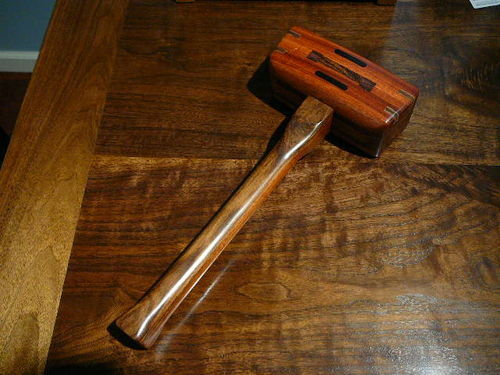 The first mallet has a walnut and maple handle. That was ear-marked for Poohbah (the swap leader and the creator of the box I received in the box swap) since he is an IN farmer and his shop sits in the middle of the corn fields. The second corn cob mallet was made as a heavier carvers mallet with a different head shape and beefier flame birch handle. There was still plenty of time to make more traditional joiner’s mallets. They needed to have a Greene and Greene and Craftsman look to them since nearly everything I make is based on those styles. The smaller head is solid bloodwood with a cocbolo handle. The larger one is Katalox and Bloodwood. The last mallet was a complete direction change using Katalox and maple. It wound up looking like a double bladed axe. The accents are copper rings (pipe) and walnut dowels. There was still time to make a couple of solid boxes with box joint corners. The walnut box has a slide off lid and the american chestnut box has a traditional lid. I did forget to put a chain on it to keep from springing the hinge. In order to keep the mallets from rattling around, I cut some kaizen foam to hold them. 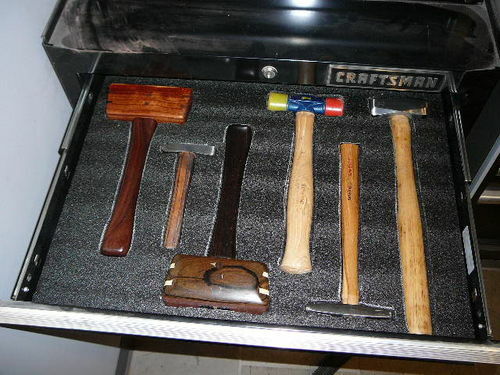 Firsts included using a rasp to smooth the handle edges, using exotics, and making mallets in general. Since I don’t have a lathe (yet) the edge profiles were created on the router with various bits and a lot of sanding. There were a couple of mallets that didn’t quite make the cut (granadillo mallet had big cracks develop in it, ziricote mallet had tear out, and dice mallet did as well) so I will keep them and use them. I call an assortment of mallets a Mallet Swap. Wow! All those mallets are exceptional, as are the boxes, but ear of corn mallets are on another level. Well done sir. You went way too far on this one. Very very kind of you. Earl, you really out did yourself. I’m beyond impressed man. Gosh, Earl! Any one of those would have been a great haul, let alone an assortment. Nice work, buddy! Earl, it looks like you hammered out a flock of mallets. Not sure what you call an assortment of mallets, but I do know what you call that assortment of mallets. AWESOME!!!! That’s what you call it. Just WOW! 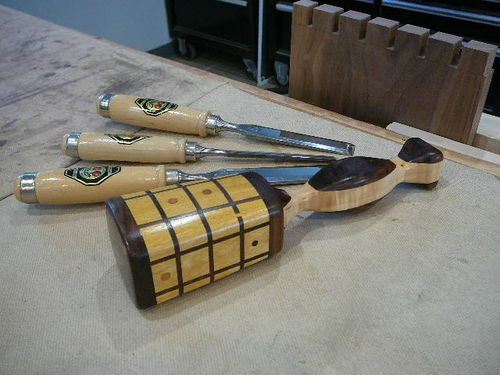 The detail put into these mallets is off the charts! Even the boxes they came in are awesome. That is the problem with making mallets. You can’t stop. 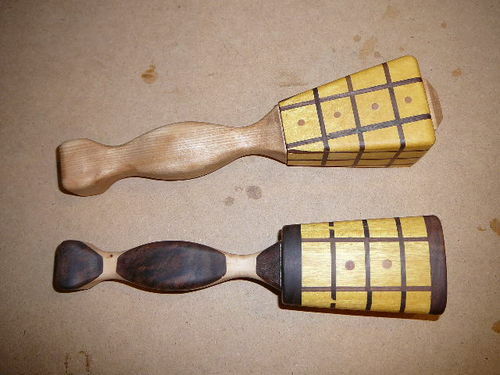 Those are some fine looking mallets. Outstanding Earl! You set the bar pretty high this time around!!! I love the variety of pieces you created! In-friggin-credible Earl. This is one of the most impressive packages I’ve seen in any of our swaps. You made some of us look downright lazy! Not only is the quantity impressive but they are, EVERY ONE, superbly designed and well executed. The corn mallets are probably the most creative but, I gotta say, the dice is my favorite :-)) You’re craftsmanship is truly admirable. Bruce – I think you have it right. Making mallets is addictive. Before you know it you have a baker’s dozen laying on the bench. Kenny – the dice are my favorite as well. now thats a box of beauties,what a swap.great job earl.